The Steel Circular Bike Rack takes a traditional design and implements contemporary elements to produce a sleek and elegant fixture. This bike rack is great to use as a stand-alone or for use in multiples to create your own bike parking lot. Each Circular Rack allows two bikes to be parked and secured, one on each side. This imported bike rack is constructed with 2-3/8"O.D. 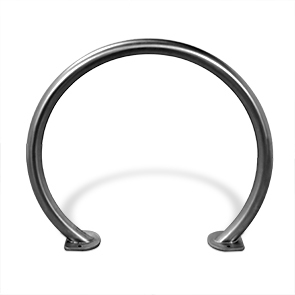 Steel Round Tubing with either a powder-coated or stainless finish. The base flanges feature a sealed design to prevent entrance of unwanted moisture or insects into the tubing.